Join the generous donors who have made the commitment to enhance the health and wellness of our community by becoming a member of one of our Partners in Health Care. Your charitable donations directly affect patients by purchasing new equipment, enhancing existing programs, creating new programs, upgrading technology, providing clinical education for patients and medical professionals, and building new facilities. To become a partner, contact Melissa Marion by phone at 724-258-1855 or by e-mail. Click here to learn more (pdf). On April 1, 2011, Monongahela Valley Hospital broke ground for a $25 million expansion project that will build on our strengths in wound care, surgery and cancer treatment and allow the hospital to remain on the cutting edge in the delivery of medical care. This is MVH's largest renovation and expansion since the construction of the new hospital in 1976. And, it is a true community project. We are building for the community - with the community. That's why your support is so important. The Office of Fund Development was established shortly after the ground breaking to help support the project and to manage the fundraising campaign. The goal was to raise $2.5 million from gifts from the community, including the medical staff, management, and employees of the hospital, businesses and organizations and grateful patients. MVH enlisted support from two highly respected members of our community to be Co-Chairmen of the Campaign: Richard A. Barcelona and the late Joseph U. Frye. Both men are past Hospital Board Chairmen of our Health System and offer unparalleled experience in the business community - in Monongahela Valley and in surrounding areas. 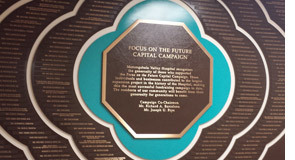 By 2013, the hospital had not only reached, but surpassed its goal of $2.5 million. A huge thank you goes out to all of the hospital's supporters, including patients and their families, physicians, board members, employees and businesses for their support. A special thank you goes out to the employees that exceeded The Hearts That Care employee fundraising campaign by 80 percent. The goal was for the employees to raise $175,000, but $317,000 was actually raised! The funds raised by the hospital's employees will be used to upgrade the heating and cooling systems in the final phase of the expansion project. Expansion of the Hospital's first floor to add four new operating suites at 600 square feet each. The addition of new Image Guided Radiation Therapy (IGRT) equipment within the Sweeney-Melenyzer Pavilion which required thicker housing. An expansion of the Hyperbaric Oxygen Treatment and Wound Care Management program within the first floor of the Sweeney-Melenyzer Pavilion. Architectural naming opportunities are available for gifts at all levels. Funds realized through this innovative program of giving are used to endow the services provided by our health care system. Your donation will be an investment in the future and in the quality of life for residents of the mid-Monongahela Valley. This philanthropic program was initiated through the benevolence, generosity and foresight of the late Dr. Norman G. Golomb and his wife, Florence. 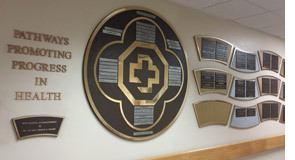 Your contribution to Pathways Promoting Progress in Health will be recognized on the commemorative Pathways wall plaque displayed prominently in our Hospital. National Doctors' Day is held each year on March 30th and recognizes physicians, their work, and their contributions to the community. 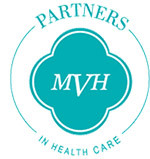 At Monongahela Valley Hospital we support our physicians and are proud to have them as part of Team MVH! To show a doctor your appreciation you can make a donation in their honor by giving to Monongahela Valley Hospital on our Donate Now page and including the Doctor's name in the Tribute Information. You can also make a donation by contacting the Office of Fund Development at 724-258-1657. When you make a gift, the doctor you have honored will receive a personal message notifying them of your thoughtful tribute. "I have no doubt that our community will step up and financially support Monongahela Valley Hospital. They have supported us in the past. This project is so important to the future of our Hospital."